Boost safety and job productivity with the first edition 2010 NFPA 400: Hazardous Materials Code Spanish-- the complete, all-in-one hazmat reference! 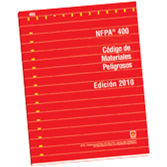 The Spanish 2010 NFPA 400: Hazardous Materials Code is a brand new document that consolidates all the fire and life safety requirements applicable to handling, storage, and use of hazardous materials into one single comprehensive resource. Includes requirements on oxidizers, organic peroxides, pesticides, and ammonium nitrate based upon requirements from existing documents -- NFPA 430, NFPA 432, NFPA 434, and NFPA 490 respectively. Contains additional material categories, such as unstable/reactive substances, toxic and highly toxic, and flammable solids. Establishes threshold quantities of each material that can be stored, handled or used before additional fire and life safety measures become necessary based upon type of occupancy, whether storage is inside or outside, and type of container.